And what about Clone Wars? Clone Wars was the biggest EU cross-promotional event that we've seen. I don't recall seeing that much from the Clone Wars line pegwarming. I think Clone Wars has proven that Hasbro can make the EU work within the whole of the Hasbro Star Wars line. My experience with that? HUGE PEGWARMING DISASTER. For the basic figs? Overshipped/distributed first 2 waves..3rd wave actually did well (low distribution quantity. I could argue with the Cartoon figs OR the reg. CW figs. It took many, many months for Annakin, Obi, yoda and company to leave the shelf. The deluxe line only the droid pack as (mentioned several times) pegwarmed...why? low distribution quantities on the jedi pack and clone 3 packs. I take this acknowledgement from 3 different areas geographically in the US during this time. I think all the CW releases DID PROVE was that if you don't overproduce it then it won't pegwarm- it has nothing to prove anything about how EU future releases will do ( IMO ). I guess we'll just have to wait to see HOW MUCH Hasbro's produces/distributes the EU future products. It relies in HOW much they can get retail to 'buy-in' to signing a contract with higher quantites....that said, I hope retail doesn't 'splurge' on this. I actually never saw the Animated Yoda on the shelves. Ever. Yes, of course there are exceptions.....I meant the non-animated one. It is difficult to speak of CW comparisons to how future EU will sell without describing the animated/non-animated version. However, I saw SO MUCH pegwarming from both that I adressed his comment considering both. I could counter this that your evidence is based on your own experience. I would agree on wave 1 being overshipped. As for the subsequent two waves? Those were relatively more scarce. The deluxe line only the droid pack as (mentioned several times) pegwarmed...why? low distribution quantities on the jedi pack and clone 3 packs. I think that the Droid pack didn't pegwarm so much as the Clone 3-packs and even the Jedi 3-packs were hoarded. The droid 3-packs just proved to be less desirable when compared with the other sets. The same goes for the Destroyer Droid launcher. All of the deluxe pieces (Speeder bikes and Swoops included) were quite popular compared to those two pieces. So your initial and follow on statements weren't based on your personal experience? Or are you assuming information from others/nationwide? I'm sure the clone 3 packs were hoarded by army builders...but I was able to easily find the ROTS ones several times in stores (all types). Which is why I think the CW clone 3 packs never sat because they weren't shipped enough...which in turn is key for items not pegwarming...popularity counts (any type of clones related to an EU success argument probably shouldn't have been mentioned) but distribution quantity is vital. The problem I(IMO) have here is that there is really nothing to this date(no prior EU line- without argument) that indicates how well a future EU line will do. Only thing certain to me is that results of a future line divebombing or succeeding are unpredictable at best. I think 1 valid point here said over and over is ..how much? How much retail will want/Hasbro produces will determine the shelf life be it wanted or unwanted. Since we cannot know this as of now..then can we really say how well an EU line or any other(OT) line will do in the future? The first wave were some of the worst figures made in recent memory, just about as bad as any POTF2 red carded junk. Hasbro did a terrible job on the designs and on most of the figures themselves. Not a good character selection either in the massively overproduced first wave. After that the next waves were better, but if they were smart, but the SA Clone should have been in each wave and at 3-4 per case. 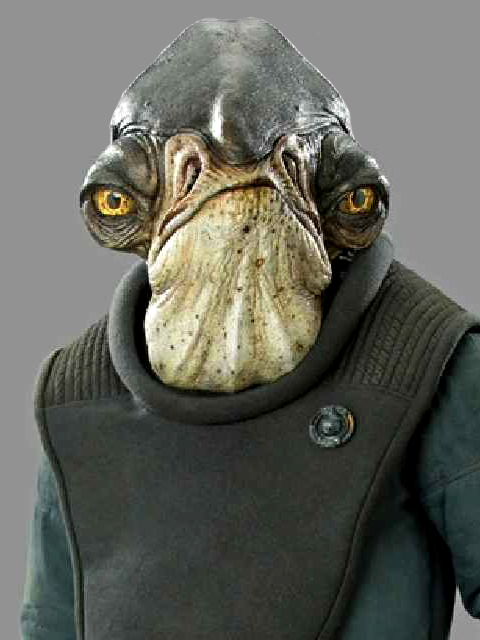 EU, if given attention to detail with realistic designs and good articulation (and no stupid Jedi armor) will do fine. Just make the figures look believable with designs you might see in the movies instead of trying to morph them with Power Rangers. This is based on a couple of factors. First, there's the secondary market demand at this time. I see a limited ammount of Clone Wars product on the convention circuit, and when I do the prices are somewhat high ($15 - $20 range for Basic Figures). I hit conventions throughout the Northeast as well as some of the midwest. Also factor in online secondary market prices, and Clone Wars is still rather high in demand. Additionally, some of my evidence is personal, anecdotal evidence. However, I will offer that since I am in one of the largest population centers in the country, that what I've seen at retail is probably closer to the national statistical average. It's all about the sample size. The fact is that there are more retail outlets and more consumers involved in Star Wars in the NY metropolitan area. Statistical studies will show you that the more data you have to compare, the closer you are to the statistical mean. And during the run of the Clone Wars line there were also the Mega-Buy 2-packs, the ARC Trooper, the SA Clone (VHTF) and the CW Deluxe Clone w/ speeder bike. The CW Clone 3-packs were the only pieces to offer AOTC Clones in all of the ranking colors at that point. That was a selling point for these sets. It's the state of army building at the time that led the Clone Wars 3-packs to be as hot as they were. They shipped, and they were bought up FAST! Now fast forward to 2005. There were a lot more offerings in terms of Clone Troopers in the ROTS Basic Figure line. Plus we had also gotten the EE exclusive SA Clone Trooper 4-packs. Those had raised the expectations of collectors, and as a result the Clone Trooper 3-packs in the ROTS Deluxe line weren't as widely hailed by collectors. Especially when there were figures like the ROTS #41 Clone out there. And the unit markings seemed less important this time around. These shipped almost as much as the CW 3-packs, but frankly they came across as shoddy and I didn't see as many people army building with them in '05. Circumstances were definitely very different. I agree, circumstances were very different with the Clone Wars Clone 3-pks versus the ROTS Clone 3-pks. This is MAIN CHARACTER EU at that, something the kids should have at least been interested in. Now if kids aren't going to buy them and Movie Purists won't buy them, who is going to buy them? Video Gamers? Not sure if this has been said yet, but everyone thinks that EU won't sell because SOTE didn't sell. Well, this year we got 2 EU figures. One of them was probably the hardest to find figure out of the entire TSC, and the other was stil pretty rare. Some people have been saying at other forums how they are just now finding Foul Moudama! So don't base how well 2007 EU will sell compared to how 1998 EU sold, because everything back then didn't sell well. Agreed. The sales have been good on EU items in the past 3 years. I see a lot of very selective memory at work regarding Hasbro and the EU in this thread. There's a lot of mention of SOTE but not so much mention of the POTF2 EU line. I know there are a number of members of this board that are still actively seeking Space Troopers and Dark Troopers from that line. And what about Clone Wars? Clone Wars was the biggest EU cross-promotional event that we've seen. I don't recall seeing that much from the Clone Wars line pegwarming. In fact, some of the Clone Wars pieces are among the hottest items on the secondary market. Try getting the Clone Wars Command Gunship now. Some of the only poor sellers in the line were just poorly designed toys, like the Destroyer Droid launcher and el bandito Yoda. But everything else appears to have sold quite well. Especially the core characters and the EU characters that were introduced through this line. There's also the matter of Clone Wars supporting not one, but two different figure line. Fans gobbled up both the movie and animated lines. Also, add in the fact that Clone Wars has been successful with licensees other than Hasbro. Gentle Giant has done especially well with Clone Wars, and one of the most sought after pieces that Gentle Giant has ever released is a Clone Wars Padme. There are also bound to be offerings for both of the television projects that are slated. More Expanded Universe from the mind of Uncle George. Hasbro has already stated that they're looking at those projects, but naturally things are still in a state of flux because of the nature of the productions and their estimated release dates. 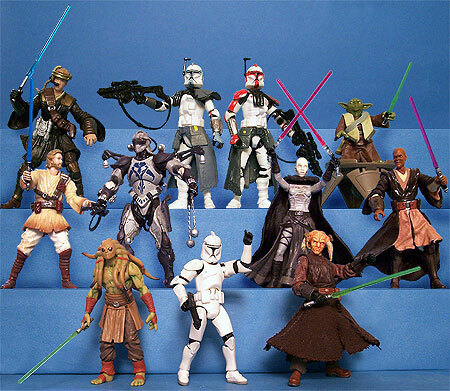 I think Clone Wars has proven that Hasbro can make the EU work within the whole of the Hasbro Star Wars line. There's no doubt in my mind that the Star Wars line will continue to be anchored by the movies. The movies are the foundation of all that is Star Wars. But as time rolls on and we move further and further past the movies, there's going to be a greater need to call upon the EU to supplement the releases from the Saga. And if you're not down with that, then vote with your dollars and don't buy the EU releases. Agreed.I saw very few CW Figures in my local stores,never did find Durge.EU Wave hit near me,but I always missed them.I had to pay $20 each just for both Luke Skywalker(DE) and the Clone Emperor,and those are cheap compared to what they go for when you bid on them. The quality of the figures didn't help. Also the first wave was massively overproduced and really was one of the worst waves of figures I've ever seen. Take into account as well that in the main like there were only two bad guys. That's pretty damn lame! Hasbro was just dumb as a goat when they thought this line out. Even their packaging was lame, and I'm a loose collector. Call me crazy, but I think if those figures were given good sculpts and articulation, the line would have been a huge hit. What the hell is a chamelion droid? Additional EU clarification: it never shipped widely and wasn't found in many retail stores. For a lot of us we ordered from the fan club directly and I recall (probably erroneously) that it was supposed to be the only way to get them. If so, then only dregs made it to retail and straight to clearance pricing on top of that. For Clone Wars, it did so well up here we didn't even get wave two of the animated stuff. I can still find all but the clones from the animated first wave in stores tomorrow if I want to. I'll grant you it arrived up here later than in the US, but when were these released? Sorry, around here those rank right up there with Lobot, Mon Mothma and Ketwol. To add to that, EU was intended primarily for retail, unfortunately the figures shipped in the same assortment cases as several notorious pegwarmers - notably Rancor Keeper - and also had the same SKU attached to previous pegwarming asst's. This caused retail to shun the assortments with the EU figures and ordered in very low amounts. That in turn resulted in a large number of the EU assortments to go to non-retail outlets such as the Fan Club. This is primarily the same reason why the Death Star Trooper and Ree-Yees only appeared at retail in the States for a very short time before getting pushed to the Fan Club. I remember it like it was yesterday actually, all excited to fine the Dark Empire figures, then weeks went by and I couldn't find any other EU figures. I had to order from the Fan Club where they sold the figures in sets of 2 at something like $17/$18. It wasn't until the massive clearances of 2000 at TRU and KB that I saw any other EU figures at retail and that was Thrawn and Imperial Sentinel which had shipped as part of a case with Ugnaughts and 8D8. As far as the Fan Choice vote goes. Though I've never played KOTOR, I'm looking forward to Darth Revan, he/she/it looks to have a cool and unique armor design which I'm hoping Hasbro can translate well to plastic.